Here is a little project I've been working on and I thought it would be fun to share it, step by step. I've noticed that I have a few new blog followers, so I thought this would be a great way to share a little bit more of what I do and a way to say thanks for your support and that I really appreciate it. Before I begin I think it is fare to warn you that first, this is my very first tutorial, and second, I'm not such a technique girl--more of a fly by the seat of my pants kind of crafter--but it's kind of hard to come up with a tutorial outlining my chaotic creative process. So please bear with me on this if I miss a vital ingredient. First, the finished product--it's always good to start off knowing what you will be creating. 2. The stamps I chose to use for this card were the real inspiration for it. I thought that these adorably spooky Halloween characters would be perfect for a spinner card. To add a bit more detail to the images I chose to use some MarvyUchida markers to color them in. 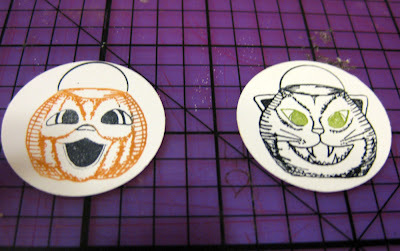 **After coloring them I stamped them onto two pre-cut circles. 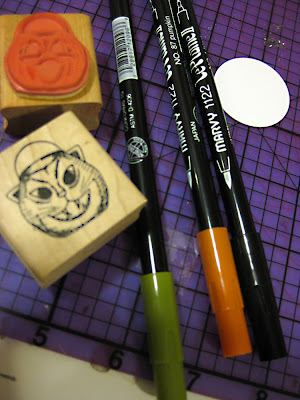 I only did it this way because I already had the circles cut from a previous project, do yourselves a favor and stamp first, then cut with the appropriately sized circle cutting tool--much easier that way. 3. The finished stamped image. 4. 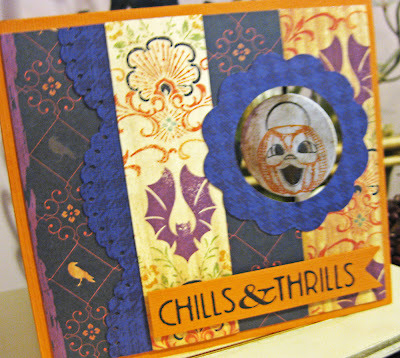 Here are some of the materials I used for this card; I chose papers from Cosmo Cricket's Haunted Collection cut into strips, Bazzill card stock, a hounds tooth background stamp from Hero Arts and a die cut scalloped circle frame from my Slice Machine's basic shapes design card. I chose a piece of Orange Bazzill textured card stock for the card base; this piece measures 5"x 4.5"
**The brown piece of card stock pictured is a piece of scrap paper that I used to attatch the actual card layout to. This is an important step because you will need to sandwich in the spinner, so think of the pieced layer as the top slice of a sandwich. 5. 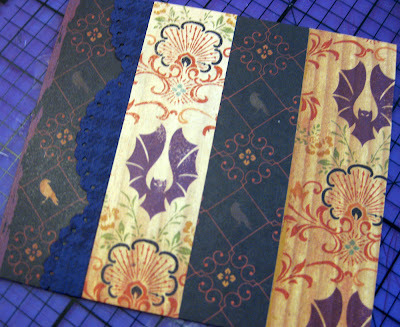 Here is the finished paper pieced layer, now we need to cut the first circle. 6. Mark with a pencil the center point for where you want to cut your circle. I chose to frame my circle with a scalloped boarder, but that is just a design choice I decided to throw in and is not necessary. Also, I off centered the circle so that I could write my message on the left hand side of the inside of the card. **You can use a circle punch to punch out your circle or a Coluzzle cutting tool, or any other tool you might use to cut a circle. Just make sure that the circle opening you cut is at least 1/8th of an inch bigger than the stamped circle piece (ex. If your stamped circle piece measures 1"1/4, then your circle opening should measure 1" 3/8). This is important, otherwise your spinner will not hang suspended. 7. Now it's time to add the string; I used black embroidery thread because I had it on hand. 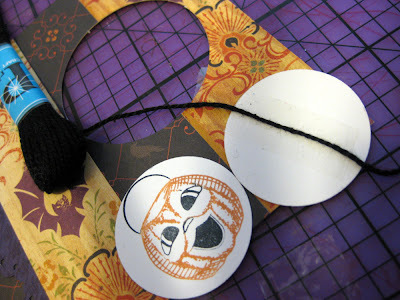 You can also use plain old ordinary dental floss, which you could first color in black with some ink or a marker. * Add a piece of double sided tape to the back of one of the stamped images, sticky strip would work best for this step. It;s important to make sure your stamped image is lined up straight before you add the string or otherwise you'll have an off balanced image. * Next, add another piece of sticky strip to the top of the string and add the second stamped piece to sandwich in the string. 8. 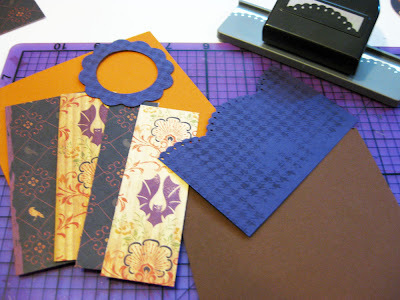 Next, cut a co-ordinating circle opening in the orange card base. 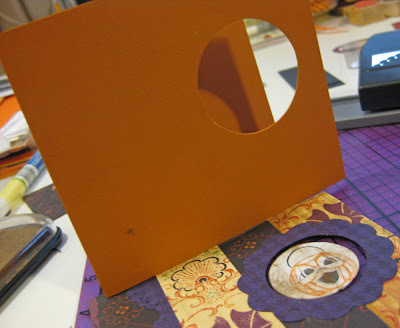 This opening needs to be the same size as the first cut circle opening on the paper pieced panel (i.e. 1"3/8). 9. Finally, adhere the front panel to the card base creating sandwiching your spinner in between the two pieces. 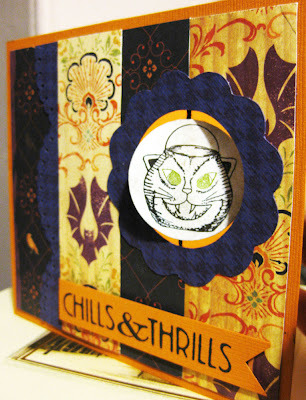 And there it is a Halloween spinner card. Of course, you can use any stamped image and design layout to make a card like this, just make sure you have fun. "Take a walk when autumn comes to town"